Casimir James "Jim" Konstanty (March 2, 1917 – June 11, 1976) was an American relief pitcher in Major League Baseball and National League Most Valuable Player of 1950. He played for the Cincinnati Reds (1944), Boston Braves (1946), Philadelphia Phillies (1948–1954), New York Yankees (1954–1956) and St. Louis Cardinals (1956). Konstanty batted and threw right-handed. Originally from the New York hamlet of Strykersville, Konstanty started as a physical education teacher in Saint Regis Falls, New York. The son of a farmer, Konstanty starred in sports in high school and also at Syracuse University, where he earned a bachelor of science degree. Jim was a member of the university basketball team from 1936-39. 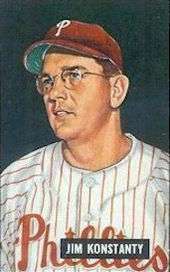 Konstanty pitched briefly with the Cincinnati Reds in 1944 and Boston Braves in 1946, and spent three seasons in the minors until 1948, when the Phillies called him up. He became a relief specialist who employed a slider and a change-up with great effectiveness. 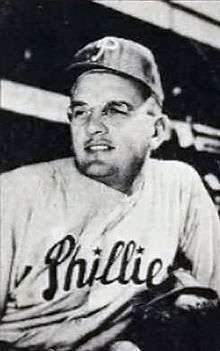 In 1950, when the Phils "Whiz Kids" won the National League pennant, Konstanty was named the Most Valuable Player; to date, he is the only National League relief pitcher to achieve such an honor. He appeared in 74 games (then a major league record), winning 16 games with a National League leading 22 saves. He made the NL All-Star team and received the AP Athlete of the Year and the TSN Pitcher of the Year awards. In a surprise move, he was named to start Game One of the 1950 World Series against the New York Yankees. Konstanty gave up only four hits in eight innings but lost 1-0, his efforts outdone by Vic Raschi's two-hit shutout. Konstanty lost some of his effectiveness after his spectacular 1950 season and was sent to the Yankees in the 1954 midseason. He played two seasons in New York, half a season for the St. Louis Cardinals, and a few games for the San Francisco Seals before retiring in 1957. In an 11-season career, Konstanty posted a 66-48 record with 74 saves and a 3.46 ERA in 433 games. Konstanty lived in Worcester, New York. He opened a sporting goods store in Oneonta, New York in 1948, and he would operate that store until 1973. He would serve as a minor-league pitching coach for the St. Louis Cardinals. From 1968 to 1972 he was the director of athletics at Hartwick College in Oneonta, New York. He lived in Worcester until his death at the age of 59. In 2008, Casimir (Jim) Konstanty was elected into the National Polish-American Sports Hall of Fame. ↑ "Jim Konstanty to Pitch Series Opener for Phils". Spokane Daily Chronicle. 1950-10-03. p. 15.